For those of you who missed the news, our queen announced she would be stepping down to let her son take over. This year she became 75 (queen for 33 years) and our little kingdom is celebrating its 200 year existence. 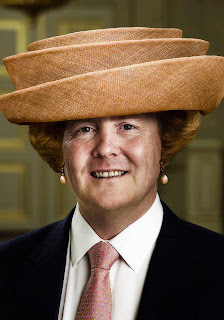 So, now Beatrix is stepping down her son Willem-Alexander and his wife Maxima Zorreguieta (the daughter of Jorge Zorreguieta - worth looking up) are taking over as king and queen on April 30th (Queensday). And this is what we are ending up with (pic: courtesy of my mum).